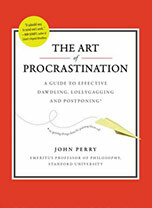 Though procrastination is often seen as a negative trait, Stanford Philosophy professor, John Perry, argues for a more positive view in his new book The Art of Procrastination: A Guide to Effective Dawdling, Lollygagging and Postponing (Workman Publishing Company, 112pgs). During an interview on NPR‘s All Things Considered, the author draws a distinction between being lazy and being a procrastinator. “So, it’s a kind of a paradox. If I get all this stuff done, how can that be when I’m a crummy procrastinator? And it occurred to me, well, there’s a difference between procrastinating and being lazy — I’m not lazy. I do a lot of stuff, as long as it’s a way of not doing something else that I’m supposed to do,” he explains. Perry also coins the term “task triage” to explain the perfectionist tendencies of many procrastinators. Putting off a task until the last minute, gives a person permission to not do a perfect job because of the compressed time frame. Ironically, the idea for book was born when the professor wrote an essay entitled Structured Procrastination as a way to avoid grading papers. His granddaughter posted the essay on the web a few years later, and the fan mail started pouring in. “All this incredibly profound and deep stuff I write in philosophy, at least according to me, really hasn’t made the impact that this little essay did,” says Perry.